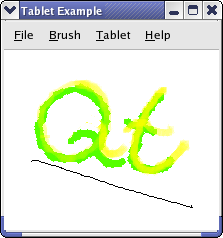 This example shows how to use a Wacom tablet in Qt applications. In the constructor we initialize most of our class variables. The first time Qt calls paintEvent(), m_pixmap is default-constructed, so QPixmap::isNull() returns true. Now that we know which screen we will be rendering to, we can create a pixmap with the appropriate resolution. The size of the pixmap with which we fill the window depends on the screen resolution, as the example does not support zoom; and it may be that one screen is high DPI while another is not. We need to draw the background too, as the default is gray. After that, we simply draw the pixmap to the top left of the widget.